I am a paediatrician in Ghana with the gift of dreams from childhood. I sincerely identified with your book especially because we were in the same profession. I have learnt so much from you. I will continue to seek more of the Holy Spirit. God bless you, I have read some of your dreams which the Lord has been showing you. That's great and praise be to God. Steven Mpunga. Dear Johnson,hope you r good in Jesus name, I am Ann kuli from kitui, Kenya.I have read one of your articles ,it has truly inspired me. Please pray for me, mostly for spiritual growth. My name is Miliswa Mpendulo Mamane. I am in South Africa in a small town called Mthatha where Nelson Mandela was born. I was playing with my phone the other day and I saw your app and the Holy spirit said I should download it but I didn't want to and I tried by all means to go back to the normal page but it wouldn't close and I had to download it and I did. I thank God for that because the minute I started reading the book I couldn't stop and it gave me a lot of answers. Hello Gods servant. How r u & family? We r ok by Gods Grace. I write to thank God for the book 'Dreams & Visions'. It has inspired me & encouraged me to pay attention to every dream. We thank God for using u. Rgds to the family. God bless u! Milly Mulesa. Hi Dr Johnson, I pray my email finds you in good health; as of me I am okay by his grace. I am Teddy Zulu from Zambia and am 37 years old and have just finished reading your book "dreams and visions " and have been greatly inspired by it. Thank you and God bless you. Sir, I came across one of your books Dreams from a friend of mine and was so blessed by it. My name is Harry and am writing from Nigeria....Thanks and God bless you. Blessed day sir Johnson. I am reading your book about dreams and visions and I like it. Thank you Doctor for your Book dreams. I find it very helpful. It has really inspired me to hunger more for God.But I need your prayers. God bless you, family & Ministry. I am Henry from Ghana and I am very blessed by this app. immense impact on me that i will like to have you as my mentor. I am a young christian and your advise is welcome sir. My name is Anthea and im from South Africa. Ive just finished reading your e-book and i was very blessed by your insight and your love and obedience for God. Your book has been a real blessing to me. God bless. Hello Thank you for sharing this book in the form of an app... Be Blessed!!! In the past, I used to have difficulties in interpretation of my dreams, but after reading your Book, all is well.God bless you. I trust you are fine by God's grace. My name is Eunice from Ghana and I have an application on one of your write-ups that is "vision and Dreams". I must confess that I have just started reading it and so far I find it very educative and spiritual and indeed it is adding and directing as well as teaching me a lot. Thank you for bringing up such an inspirational piece. Dr. am so overwhelmed because this book has come at the right time just as I needed it most and reading a few pages has really lifted my faith up in my struggles this few years. God bless you so much for your book Dream Vision Still Voice. It's has been a blessing to me. I am looking forward to reading more from you Sir. By the grace of God I manage to download one of your books (DREAMSmAND VISIONS). I have read some of the chapters. Reading your book made me realize how special I am in Christ. I have found my restoration. The zeal to serve came back. I like the part of binding the strong man very much because I see myself there. May the Mighty one of Israel continue to reveal himself on you. Know that you are a blessing to me. I just downloaded your book on dreams some hours ago and it is an important tool in our christian walk. Its an app worth sharing. It will help many of us. As I mentioned earlier, I have just read a few pages but already I have learnt several lessons. Stay blessed more and more. Hello sir, My name is Sujin Mathew I am a student in Canada . I have been reading your book about your visions and dream, I wish you could have add more, It encouraged me a lot, whenever I traveled to and fro from my work and in my travels I read your book and it was an amazing experience. Recently, I started to pray for the anointing of Holy spirit then just after that I found your book. My favorite dream in the book is the " hands that clean an uncleaned vessel to fill new oil.. so I'm also eager to have the same washing and filling up of Holy spirit.its very hard to live a Christian life without Holy spirit I realized. Please pray for me to be filled with Holy spirit... also pray for my family back home . Good day Dr.Johnson. How are you? I'm reading your book titled "Dreams and Visions" and I'm so loving it. I'm not finished, but will quite soon. Please help me pray! because this is how I realize, the Lord shows me things that are happening around me. Praise the lord pastor..I read your visions and dreams book fully. it was a great.Jesus spoke to me a lot through this book. Your book is very powerful pastor. thank u for this book .pray for me pastor. Praise the lord. I am indeed a blessed man after reading your book on Dreams. My faith has been lifted. I therefore pray to God that He may continue to bless you and the Ministry He has deposited in you. God bless you sir. I read your book. I am from Nigeria and it really blessed my life. I just finished reading your book about dreams and visions and I must say that words can't describe how helpful and eye-opening they have been for me. I am a 27year old African lady. I hope this email gets to you. I wish you and your lovely family more blessings and God's divine protection. Thank you Dr Johnson for this book. May God richly Bless you. I now know that God surely speaks to us all, not only superior man of God. I will be glad to print out this book and share it if you give me permission? I do not know how, but I stumbled upon your "Dreams & Visions" app, while searching for biblical content. I loved it. I am usually a poor reader, but I finished the readings in a day. It kept me engrossed. I felt some sort of connection, though I do not know who you are. Do email me any free pdf of your christian writings / books. I would love to read them. I humbly write you in the name of our dear Lord Jesus Christ. Assuah Patrick Ferguson is my name, from Ghana. Dr, I have neither watch you on tv nor listen to your audio tapes, but had come to know you through your book titled "Vision and Dreams". That I downloaded on play store through my mobile phone. It seems you wrote this book because of me....(lol)...GOD bless you for what you are doing at this end times. The book, what I can say about is : 'is a subset of the Bible', for it contains the very words of the Bible. It must be the Lord who allowed me to stumble upon your book Dreams, Visions, The Still Small Voice and Miracles and downloaded it last Wednesday. It has been so many things to me (maybe all that you listed at the end) and I just finished reading it. I praise the Lord Almighty for leading me to your book in time. Though you are worlds away from where I am (Jamaica) I believe you are a man of God hearing from God. Hence, I am asking you to help me pray that the Almighty God will strengthen me, that I may not turn back from this Journey with Christ. Please let me know if the Lord shows you anything regarding me or my children. Praise be to our Lord and Savior Jesus Christ. Hope this email finds you well. Praise Jesus for your online book i.e Dreams, Visions, The Small Voice and Miracles. Thanking you. Hi Dr Johnson, I came across your book * dreams and visions* and at a first glance in Google play store, I wasn't expecting much from it but as I send you this email, I have been so grateful to God almighty for giving you the revelation to birth this book. I just suggested this book to a friend late last night and shared him the link. To imagine you made this book available to us without charging a fee or putting ads to me is more than a blessing. I keep blessing God and praying for you each time I open this ebook. U might not understand how much this book has touched my life...only God does. I just followed the link to * what's new* and saw your blog but cudn't comment bcos I wanted to stay anon and cudn't get an option for that. Thank you very much for this book. I am from Nigeria and I want you to know that a lot of people are grateful to you for this book. You have reached out to so many lives and remained selfless in your pursuit for souls for the kinGdom of God. I have now completed reading your book and I must say that I found it inspiring. God bless ur work in the Lord. I am happy I read the book and hope to read it again. God bless u and ur family in Jesus's name. Thank you for your book entitled dreams and visions that has touched me. Surely God is still talking to us. I have just finished reading one of your books on Dreams,Visions and Miracles. I find the short stories very interesting and enlightening and I can totally relate to them. I too have a gift similar to yours and would like to read more of your works. I am an in-flight attendant stationed in Nairobi Kenya but fly frequently to India(Mumbai) and Dubai. My name is Delma and I am from Papua New Guinea in the South Pacfic Region. I was delighted and blessed to have read dreams PDF. God is good. My name is Rose, I am 29 years old, a born again Christian. My soul got filled up with gladness after coming across ur app. I would like to thank the Almighty God for this opportunity; I am busy reading your book of the dreams and visions u had and some of them are similar to mine. Dear man of God. I just finished reading your experiences with the Lord through dreams and your ministry. I'm truly moved and thank the most high God for His anointing on you. Pls pray on my behalf. Im a widow, 54 years old with five children. I have the dream gift also, but these days i forget the dreams as soon as i wake. Please remember me in your prayers. Thank you and God bless you. My name is Isaac Ansah, a Ghanaian and also an upcoming servant in the ministry. I came across one of your books while researching on which types of books to download and read on google play. I have really enjoyed your book "Dreams and Visions" and am still enjoying reading your book and even hope to get the other books written by you to read also. Your book"Dreams and Vision " has really blessed me and has brought most of the changes in my spiritual life.. It mostly deals with our difficulties in our spiritual life in Christ and also, how the devil works in subtle ways which if you are not careful, you fall prey easily..it mostly talks about your experience in the ministry..I am still enjoying it..I love dreams and vision too but whenever I dream, I don't remember and even of I do remembered, I don't get the interpretation too. but when I came across your book, I can now remember some of my dreams and also interpret them too. I am still working on the principles and advice you gave through your experience in the work of the ministry as Man of God. 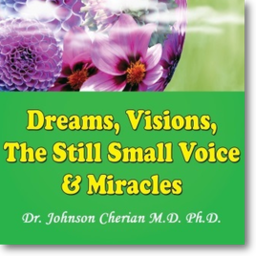 Greetings Dr Johnson Cherian ,I have just completed reading your dreams book and I am so blessed.May the Lord continue to do exploits in your life,may you continue to be a blessing in every person's life.Sir do email me some of your books please.Have a blessed day. Concilia Dziike. Sir, I read your e-book about dreams and I really liked it. Please sir i m writing from Nigeria. My name is Chinenye, I am a born again Christian and I desire so much to have an intimate relationship with the Holy Spirit but my dream life is not very correct because most times I don't remember my dream not to talk of understanding them. Please can you help me? Thanks.....Expecting your reply. God bless you so much for your book Dream Vision & Still Small Voice. It's has been a blessing to me. I must confess that I have just started reading it and so far I find it very educative and spiritual and indeed it is aiding and directing and teaching me a lot. Thank you for bringing up such an inspirational piece. Dear Pastor...your writings have inspired me a lot and understand the works of the Holy Spirit. Thank you for all those inspiring real life stories. Thank you Pastor. God bless you abundantly for the glory of His name. I am enjoying your books of dreams, it is really helping me so much. Good day sir,i read your book on dreams and vision,i must say that its so inspirational,i pray it continues to touch lives worldwide. Thanks for this wonderful price of divine writings. Thanks sir Johnson I thank you for the encouraging word of God, pleasure to read more of your writings. Thank you for this book of yours because I did not understand about dreams and I thought it was just something with no reality, because of some other preachers explanation.Thanks. I am very blessed to have come across one of your books.You are really a blessing Pastor Johnson. I am pleased with your book called Dreams and Visions; this book inspired me a lot. I am Alpha Jeremiah from Zanzibar Tanzania who I serve the Lord as a Pastor in an underground church waiting for the Lord to open doors. I have read all the texts in the app I downloaded and 75% were speaking to me directly and I'm very grateful with this materials and I believe it is the Holy Spirit who led to download this app. I believe there is a purpose for me to be connected with you. I expect to learn a lot from you Servant of God. I just started reading your book and in just a few a chapters, my faith in God have strengthen. I am a full Gospel Pentecostal... The church I go to is call Love and Care Ministry... Its a small Church but we a gradually expanding. I am a Sunday school teacher and we just started our women's group... I am going to share this book with the everyone. Thank you for sharing your experiences with the Lord.. May God bless..
Hello Pastor Johnson, My name is Privilege Chipanga. I have just been going through your Dreams & Visions e-book and i believe God does speak to you and you have the grace to get their interpretation. I have just finished reading one of your online books " Dreams and Visions". I am awed by what I've read. Gudday sir, am Hassana from Nigeria. I downloaded your electronic book called dreams and vision. I must say your book has been a blessing to me. All I want to ask of you is that you pray for the same grace upon my life that I may see dreams and vision. May God bless you! Dear pastor, I am so thrilled to have read your book: dreams and interpretation. Am so blessed! Thank you for writing such an interesting and eye opening book that you made available for people like me. Thank you so much and may God continue to increase your anointing and fill you with fresh fire sir. Amen! Good morning man of God. I read a book of yours this week and I am really inspired. How can I also build such a close relationship with God and how do I hear that still small voice?? Thank you so much for the book-dreams. I have read and am reading it again. It's been an eye opener for me, I never thought dreams and visions are really God's way of telling us something about our lives but i have realized that God reveals some things to us. Pastor. How are you? Thank you for the book, it helped me and l finished crying because of the anointing in it! And How God was communicating with you through the dreams. The reason why l googled about dreams it's because l sometime have dreams that l have no idea what they mean. My prayer these days is "God give me clarity"
Still reading and sharing your book.wish to hear from you. I have thirst and hunger to communicate with God through visions and dreams. The Lord blessed you with wisdom and you wrote a book on the subject matter.. Praise the Lord!!! I downloaded your app long ago, and had read your dreams pdf today!What a blessing it is!!!! Your testimony encourages me to seek God and trust Him more! Please pray for me and my family and church. Glory greetings in the unmatchable name of Jesus Christ. I am Pastor Moses Simon, a Sierra Leonean living in the Gambia for now. I have been a part time and full time pastor with experience in church planting, church mobilization, Church growth and development etc. Sir, i came to know about you through your book dreams & visions and i am so impressed. Greetings from Nigeria in the name of our Lord and Savior Jesus Christ. I have read the book and am greatly blessed by it. The detailed recall of dreams, their clear interpretations and biblically-inspired application presented an edifying message in each case. It's a rare material. I have commended it to a minister who also flows well in dream matters; I know he'll find it very useful. May God continue to find you serviceable in HIS vineyard. Have a real blessed time in JESUS name. I just read some fragments of your book, dreams and visions and I felt touched. I like what God is to you. I read your book online and was really blessed. My husband and I are ministers of the gospel. Please pray for me to have visions and dreams. Thank you. Hello,am Oge from Nigeria. I read your book dreams and visions. Wow! Is amazing how God speak to us. The book taught me how to recognize God's voice. I wish to have more of your books. I pray that God will continue to empower you spiritually,protect your family and also meet you at the very point of your need. Remain blessed. God has tremendously used your book on dreams to revive my Prayer life to stir up His Spiritual gifts that is in me. And I believe the fire God had rekindled shall continue burning till Jesus. Also I praise God for His grace upon your life. I pray that Almighty God continually be with you and keep you from falling, and for you to continue do what is right in His presence always. May God be with all your family members...amen. Thank God for you to keep on obeying Him. Thanks for your book :Visions and dreams. Book has inspired me. I am a pastor in Kenya. Your book is great. God bless you. So enlightened on dreams. I am very pleased that I found your book in play store, Dreams n Visions. Thank you for your book dreams and visions it is very helpful and good for spiritual growth.may the good Lord bless you in Jesus'Name. Praise the Lord Almighty Jesus Christ. I got ur link thru a very good friend of mine n have shared it with most of my friends. I have just a few chapters to read. My mother just finished reading and wanted to know how we can get copies of this book to distribute among those who don't have or use Internet. Can you please guide me on the same. I have to say, this book has been extremely insightful and have helped answer a few things about what is happening or may have happened with us. My mother is a born again since the last 10 yrs and I am now since 6 months. Lots of inner turmoil I've been going thru the last few days and it's making me sad. But I know am in a better place with God in today's day than I have ever been. Thank you once again for writing this book. Thank you for enabling us to understand Jesus and his ways more better. God bless you n your family. I have been very much encouraged and blessed by reading the visions and experiences. Thank you so much. I read the book and I am happy and wonder how God speaks to us in each and every situation. I am also thirsty to hear his voice. Fascinating and interesting real life stories and truths on every page. A book to be read by people really seeking God. I am currently reading your book on dreams, visions, and still small voice. It is a wonderful piece. I have been born again for many years. Kindly help me: I have an unquenchable desire to walk in the realm of dreams, visions and the prophetic. Can you please advise me on what to do. I thank the Lord Almighty for His grace and gifts of the Holy Spirit in your life,and your obedience in using them to bless others. I thank you for your book about dreams,it is a great help. It has also encouraged me a lot in my walk with God. May God be with you and your family always. Lucy C.Masinde from Dar Es Salaam,Tanzania. My name is Winners Chabalala.. Am South African... I am grateful to God for this book..and for all the knowledge and wisdom used to writing it....I found it in Google play. Greetings man of the Most High God. You are a blessing to me. I learnt alot from the book you wrote, I am deciding to pray after every dream I am able to remember . I gave my life to Jesus Christ at my teenage years. I had many dreams in my deep sleep some of them came to pass , I came across Job 33:14-30 and understood that God speaks through dreams and visions too. I am very encouraged and felt the presence of God as I read this book. Am so blessed to have had a chance to read your book on dreams. My relationship with the almighty God has definitely moved to another level. Thank you so very much and may the almighty continue to use you and bless you all the days of you life. I hope I will be able to download the other books you have written coz I have really enjoyed your writings, and am blessed and encouraged. Hi. Thank you so much for this app. With your experiences it's teaching me how to understand my messages and warnings from God. God bless.